ROME (CNS) — Faith is a continuing path of growth and maturity that cannot progress without the presence of temptations, Pope Francis told priests of the Diocese of Rome. 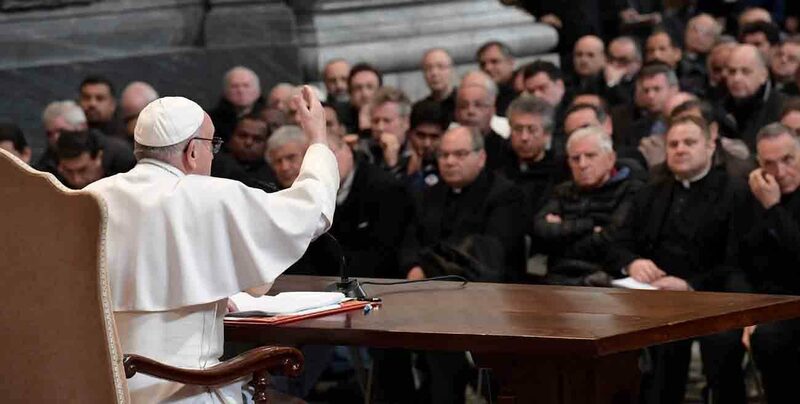 How faith develops in “a man, in a priest” despite his flaws can be seen in St. Peter, the pope said March 2 as he led a meditation with diocesan and religious clergy. “One thing is clear: Temptation is always present in the life of Simon Peter and temptation is always present in our lives. Moreover, without temptation, you cannot progress in faith. In the ‘Our Father,’ we ask for the grace to not fall but not to not be tempted,” he said. The meeting, held at the Basilica of St. John Lateran, was delayed for roughly 45 minutes as Pope Francis heard the confessions of a dozen priests, according to the Vatican press office. “And we priests, if we do not have a mature faith capable of generating faith in others — that is, fatherhood — we can do harm and so much evil. But if faith grows, it does so much good,” the pope said, departing from his prepared remarks. These three components, however, hinge on a “fixed point.” The pope gave the example of a basketball player who, with his foot firmly “pinned to the ground,” moves to either protect the ball, find a way to pass it or look for a path toward the basket. Memory, he explained, feeds and nourishes faith, particularly the memory of the “covenant the Lord has made with us” through parents and grandparents. Speaking off-the-cuff, the pope recalled a retreat when he found it difficult to be touched by the preacher’s meditation on death and the final judgment. Pope Francis said that faith is also strengthened through hope, which helps priests to “find new things” from their past to encounter God in those they are called to help. To understand the past and sustain hope for the future, he added, discernment in the present is important and it often involves taking a step back to see the bigger picture. An example of a progression in faith through memory, hope and discernment, he said, is the apostle Peter, a man who is a “paradox” in that Jesus would often extol the virtues of others while Peter was often reproached for his lack of faith. Peter’s faith, however, is “faith that is tested,” and through that he has the mission of confirming the faith of the disciples and the church today. At key moments in his life, the pope continued, Peter is strengthened in his faith. Jesus “prays for him so that his weakness, and even his sin, is transformed into a grace” for him and for all.